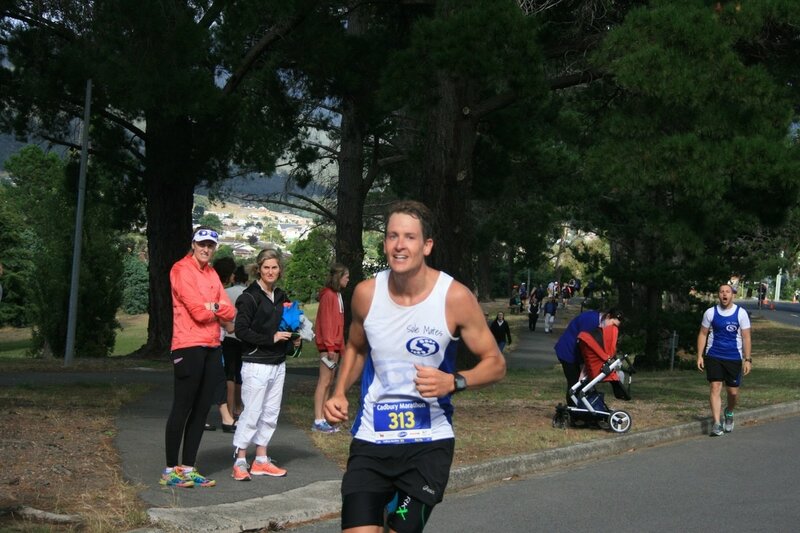 ​I wanted to run a PB in this race. It is not often that I go into a race with that sort of confidence. Usually I go in with an open mind, setting a conservative (just about the only time I think it is okay to be a conservative) estimate for my time and am happy to complete the race without injury. In fact this time last year, I withdrew from this event because I wasn’t convinced my body had recovered enough to even finish it. That was pretty gutting, but it makes it even more exciting to be back a year later and confident of doing my best. And I was confident with good reason. Over Christmas, a lot of people let their weight balloon like government debt under a Liberal government, but I had been pretty good. In fact, aside from rolling my ankle playing touch footy in the week before the race, I had trained and prepared better than I have previously for any other race (this isn’t a high bar, but it gave me some confidence). I realised that I was no certainty to achieve my goal, but I wouldn’t be too hard on myself if I didn’t either. I don’t actually regard failure as a bad thing after all- just a step towards an even more satisfying triumph. ​But my ankle had been giving my some nerves in the week leading up so I went to Back in Motion physio, where the wonderful Georgie had a look at it and taped it up for me. She was good enough to tape the other one at the same time which was quite nice, as my self-taping jobs tend to get a bit messy. In fact there has probably been more dodgy tape on me over the years than on Donald Trump. So, professionally taped up and feeling pretty good, I rocked up to the Cadbury estate around 5:30. Academically, I was totally in favour of the early start as I don’t like running in the heat or high UV. However practically it turned out to be a bit of challenge getting organised in time and while I got to the start line reasonably well-prepared, I didn’t get the chance to get around my various friends who were running their first marathon and give them a final word of encouragement (although I doubt they were short of this). Well look at me rambling on. I’ve written half a page without even getting to the start of the race yet (but cut me some slack- Malcolm Turnbull has been Prime Minister for over a year and he has done nothing). But let’s talk about the race. ​The starter's gun fired (One Nation candidate, Peter Rogers, may argue that it was actually fired by Mossad, the AFP or John Howard himself, but most people who aren’t crazy conspiracy theorists will probably agree that the person seen firing the gun was the shooter) and we were away. I started on a pretty slick pace (well I thought it was anyway) as we did a quick couple of laps around the Cadbury estate. 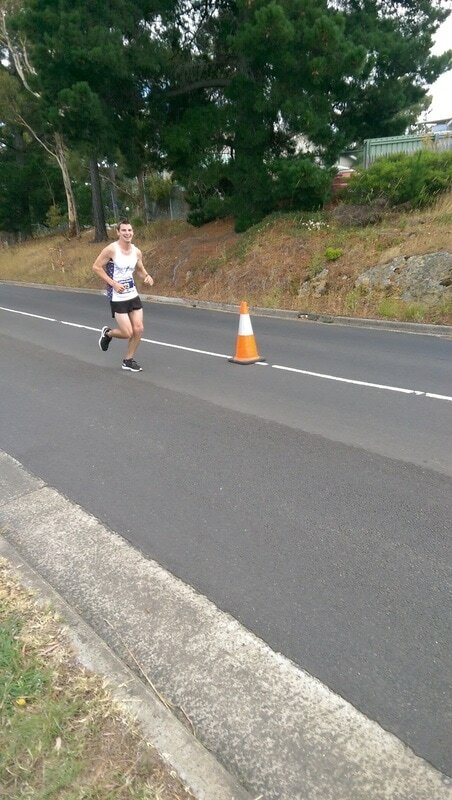 About 500m, in I looked around slightly guiltily and was relieved to see Lewinski running close by. 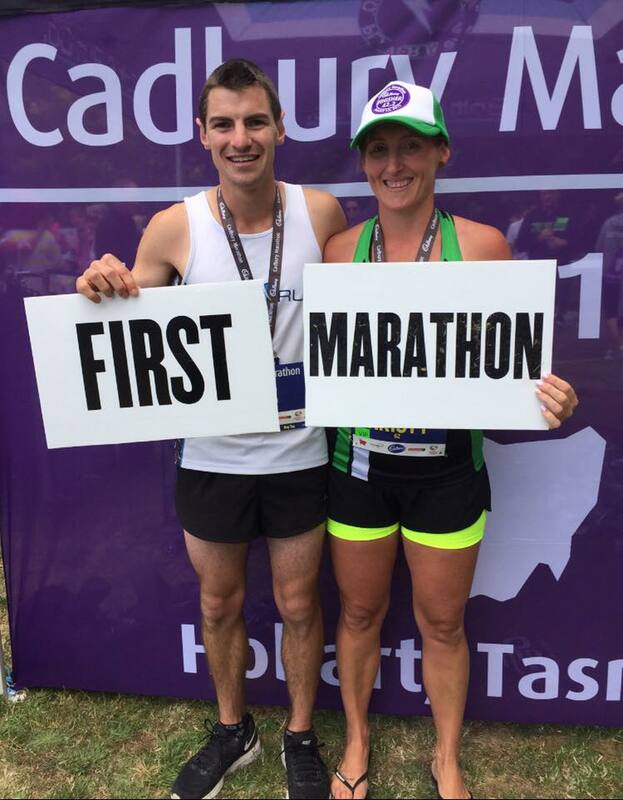 After running most of the Bruny Island Ultra together, we had agreed to aim to run the first half of the race together and see how things went. We had also agreed on a rough pace for the first half but after we ran down the hill from Cadbury’s and up past Windermere Primary, (including a strange little detour through the school carpark) we were still on a much quicker speed and both feeling pretty good. So much for the near-mythical negative split. I would just have to hold on for as long as I could, like Sussan Ley trying to keep her job. At this time of the morning the roads were as quiet as Bill Shorten is on our disgraceful treatment of refugees (yes Bill, silence is a choice and makes you complicit in abuse). It was a small climb up onto the Brooker Highway and then a few gentle undulations as we followed the highway past MONA and Montrose Bay High School. I like running the section past the school towards the DEC. There was an unobstructed view of the water to my left and the mountains rising to my right, which were struck by a few narrow shafts of sunlight breaking through the otherwise thick cloud cover. This is also the area used for the regular Solemates Handicap, which is not only a great social morning, I think it has also really helped improve my speed for both medium and long distance running. We followed the coastal road past the DEC, where Glen had kindly stationed himself with a container of lollies to give to people, before coming back out onto Elwick Road the other side. I grabbed another water from the drinks station near the lights and even managed to get most of it into my mouth (unlike at the previous drinks station). Then we were pushing our way up a gradual climb to the Bowen Bridge, which was a bit further and steeper than I had realised previously. Crossing the bridge itself can be a nightmare as it is very exposed to the wind. We were lucky today though and there was only a gentle breeze, which did little more than cool us down. It was on the bridge that we began to see the lead runners coming back the other way. The first few were going fast, separating themselves from the rest of the pack quicker than Corey Bernardi is threatening to do from the Liberal party. I had been told we turned around at the end of the bridge, but much like a Tony Abbott promise, this was a lie. 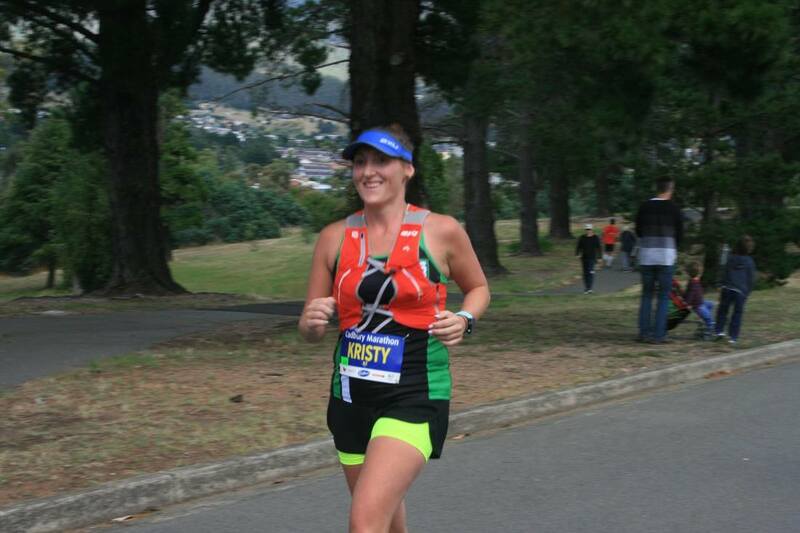 We actually had to run for another 300 metres or so past the end of the bridge before reaching the turnaround point. This may not sound like much, but psychologically it made a difference. 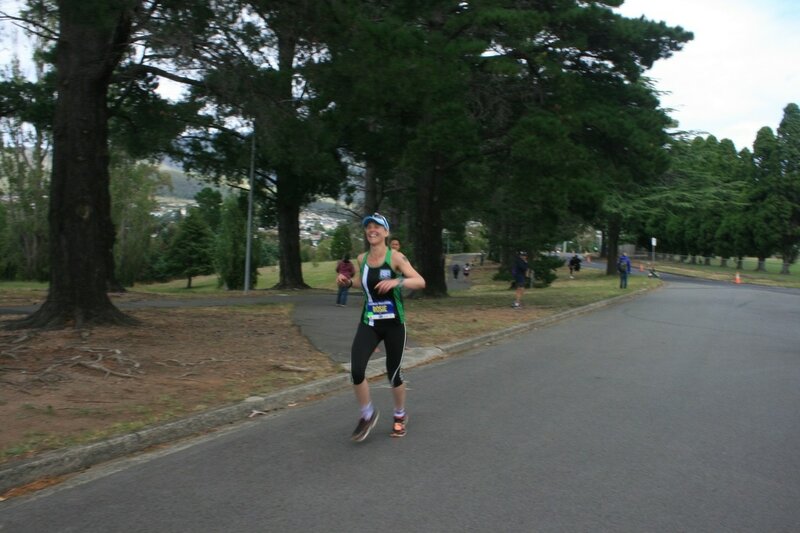 The back half of the first loop was probably my favourite part of the race. 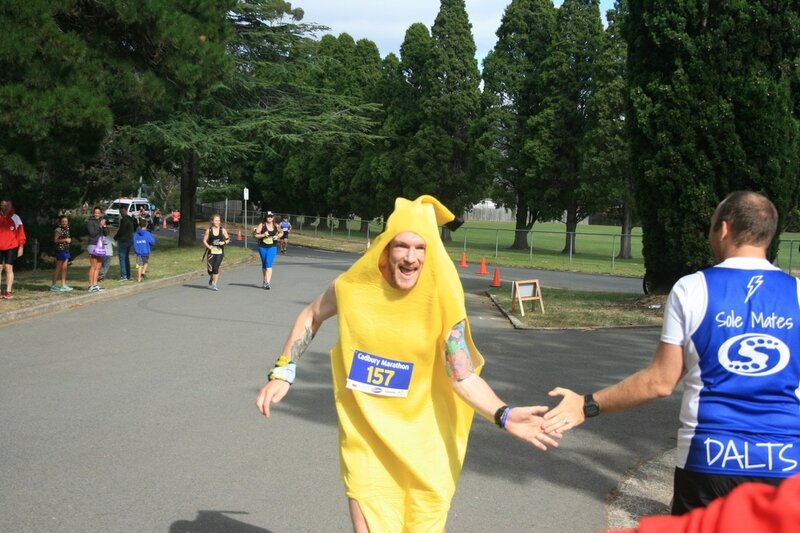 We saw a heap of friends coming the other way (including Ben dressed as a banana) from both the half and the full so there was plenty of words of encouragement and the odd high five (not the children’s entertainment group, although I’ll admit they were definitely a bit odd). 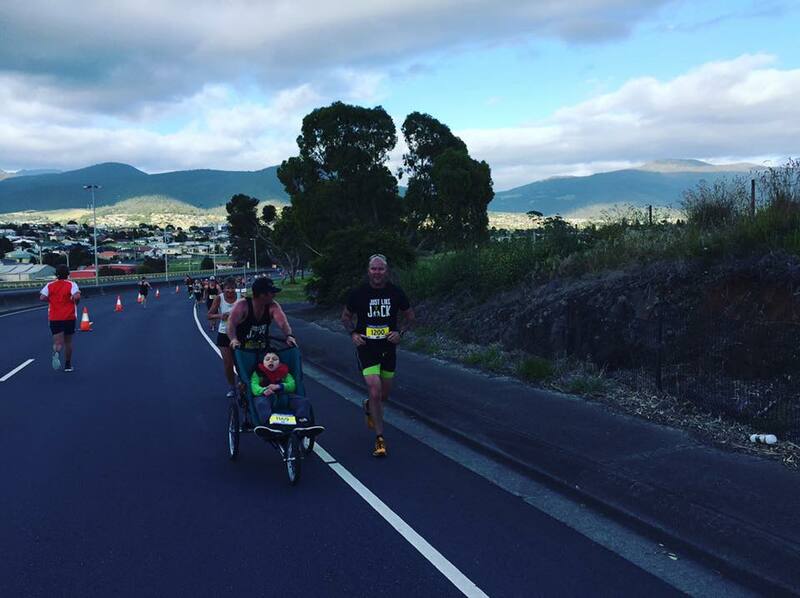 We crossed back over the bridge and lengthened our stride to pick up a bit of speed on the way down the hill, getting some words of encouragement from the inspirational (and colourful) Peter Wheatley before turning towards the water and following it back to the highway. The highway section was where we saw the majority of racers so it was a pretty busy section for greetings and high fives (well at least it was for me- without his glasses, Lewinski has less vision than the Coalition government). The Just Like Jack Team rolled past wearing the same shirts as me. I considered asking them to put jackets on, but repressed my inner Amber Sherlock and just gave Jack a big wave and a cheer, getting one of his distinctive roars in response. The weather had been perfect up to this point. The wind was still and the clouds were protecting us from the sunshine like the Murdoch Press protects right wing politicians from objective scrutiny. But a northerly breeze was beginning to build and we had to push a little harder, working into it. We hit the half marathon point in a time faster than I have ever run that distance. And we both still felt pretty good so couldn’t see much reason to go any slower. However contrary to my original plan I didn’t see myself having much scope to go much quicker either. After another kilometre, we were turning off and heading down the hill past the school towards the turnaround point. 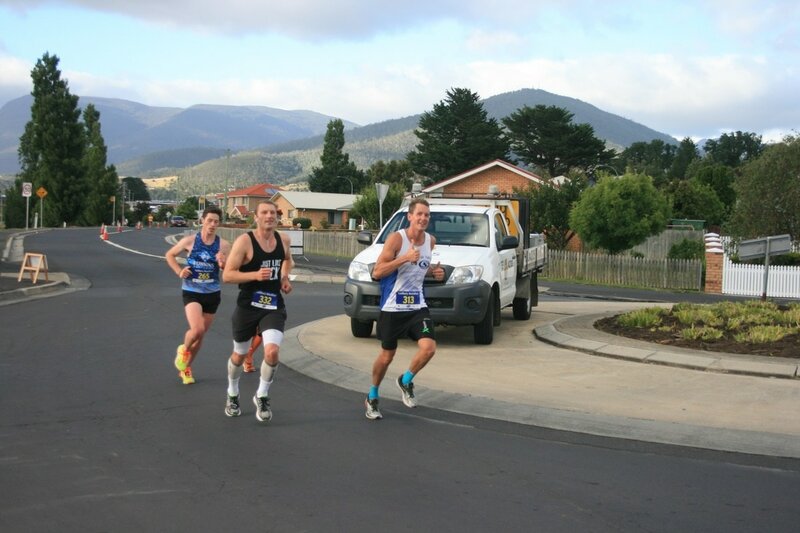 Having the second lap start at around 23km was quite good, because we knew we were already more than half way. We had barely turned around when the leading half marathoners passed us, basically sprinting the final kilometre to the end. 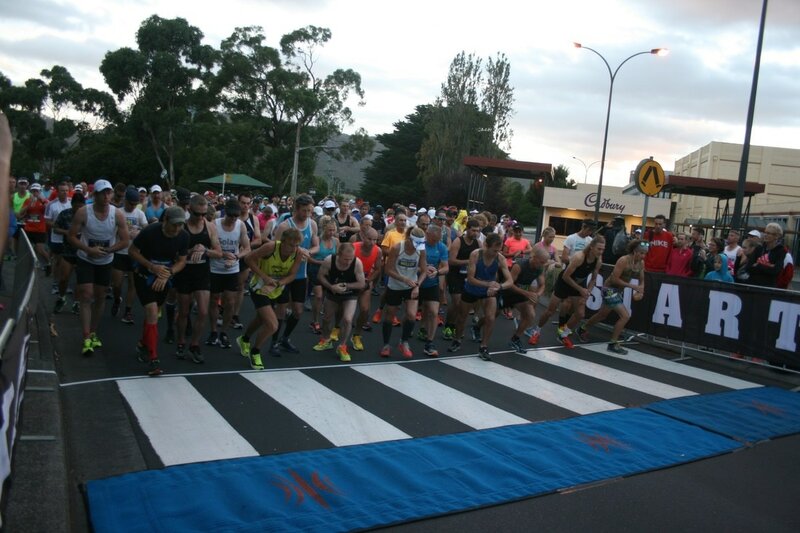 After the outright leader there was a steady flow of runners heading to the end of their race. We continued to motor pretty comfortably until we turned in front of the DEC. At this point without really discussing it, we slowed fractionally and I started to feel the first signs of muscle fatigue. 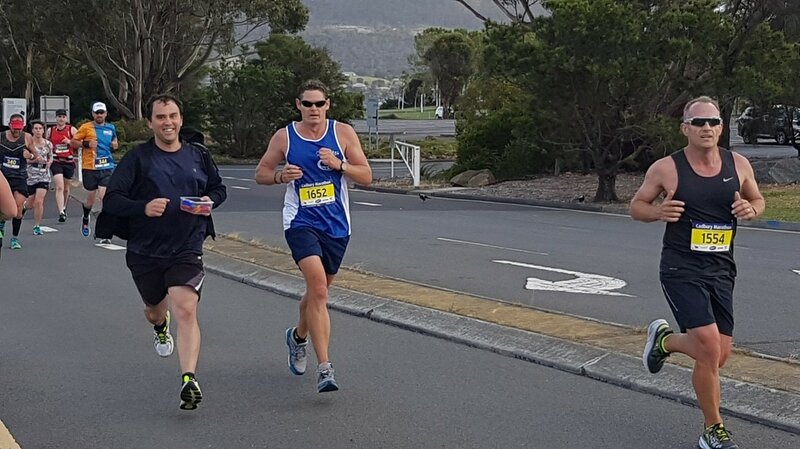 I felt like I was in danger of dropping off so I tucked in behind Lewinski for a few kilometres and stopped looking at my watch, just concentrating on keeping up. 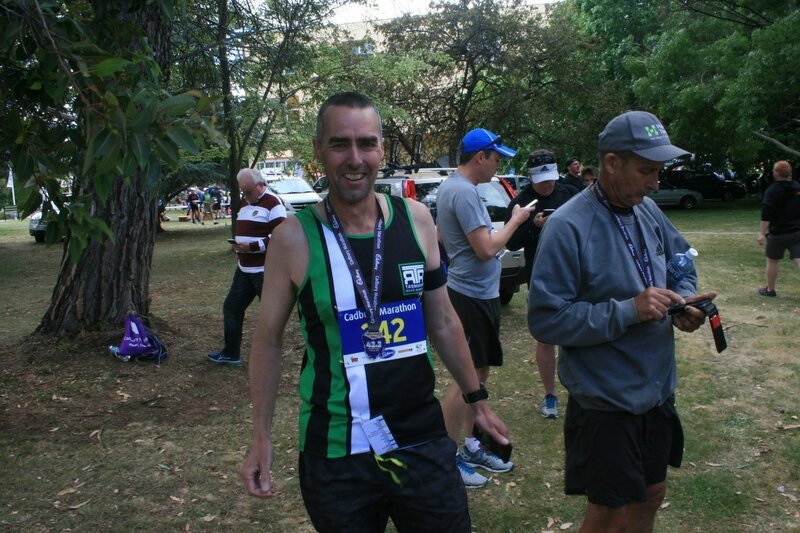 After a little while I adjusted to the new pace and was able to resume running alongside my friend, although by now we had about as much to say to each other as Rudd and Gillard. It was when we hit the Eastern Shore for the second time that we began to slow more noticeably. I went from being a little tight to quite fatigued pretty quickly and felt like I had been treating my calves worse than the live export industry. Not only were they sore, they had also lost power, so the same effort level was generating less distance in my stride and less speed overall. But there is something comforting about the last time you turn for home, so I dug deep and kept going. Much like Kellyanne Conway, I figured if I pretended problems weren’t there they might go away. The headwind from earlier was a fair bit stronger by now and it was genuinely hard going. ​We climbed the last undulation of the highway and turned down, heading back towards the Cadbury estate. It was at this point that Lewinski started really struggling with leg cramps. Seriously,I hadn’t heard this much fuss about a Lewinski since 1998. 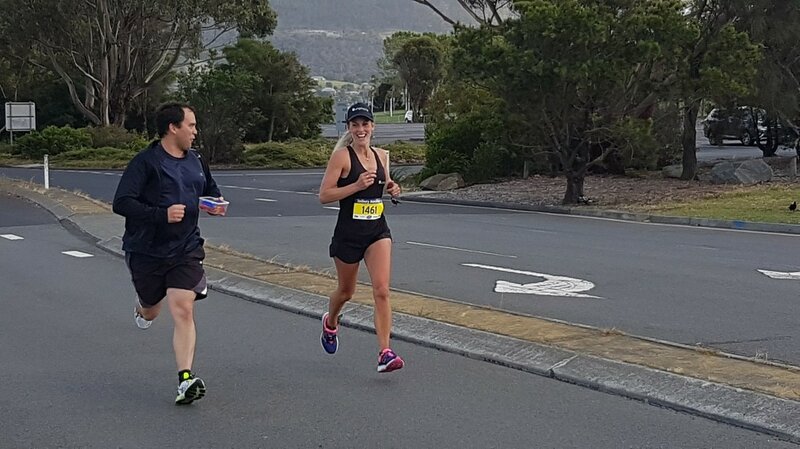 There was little more than a kilometre to go and we were well under target time, so once he had assured me he was not going stop or anything, I said goodbye and lifted my speed again. ​I hit the much-talked about hill leading to Cadbury’s and pushed up it without slowing a whole lot, but not exactly sprinting either. Near the top, I saw my dad waiting with a camera so I tried to smile as I passed him (not very successfully as it turned out) and entered the final few hundred metres. This last stretch was a really special moment for me. I had set myself a big goal, gone out with a bit of courage and pushed myself hard to come in even faster than I had dared hope. 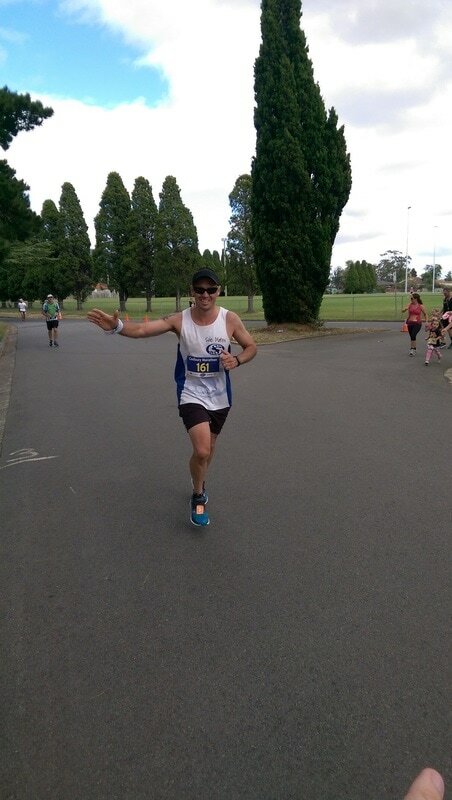 As I ran towards the finish line I passed groups of friends from Solemates, Just Like Jack and Get Fit Tas and it was wonderful to share that uplifting moment with so many friends. 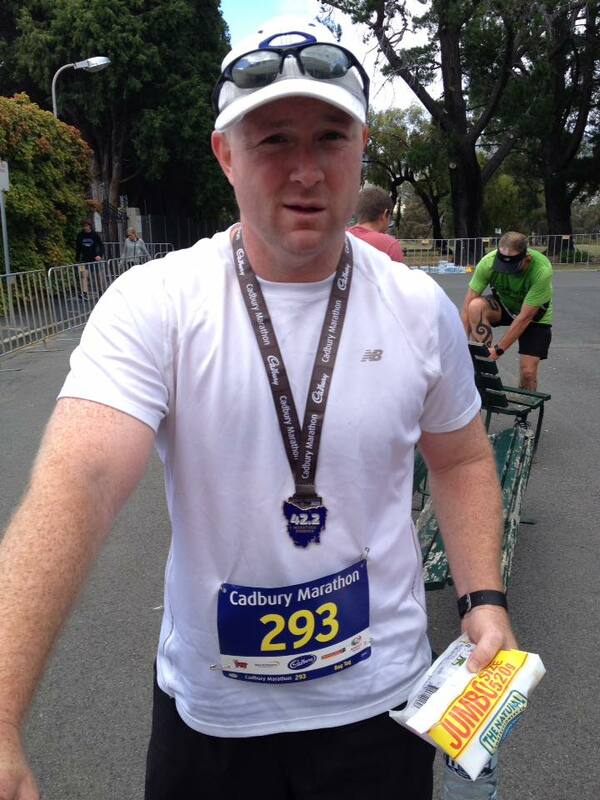 In October I had been overjoyed to take a few minutes of my PB in the Melbourne Marathon. Today I had taken another nine or so minutes off that! 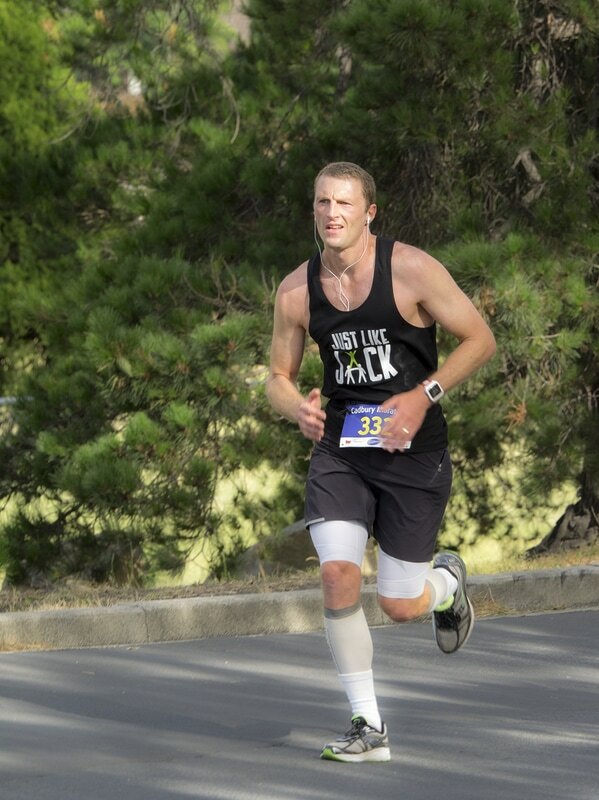 ​Lewinski was less than 20 seconds behind me. We chatted at the finish line, both absolutely stoked with what we had achieved (alright there was more bromance there than Biden and Obama), while the gorgeous Bec gave us a bottle of water each. I then found my wife, my dad and step mum, which was another special moment, before slowly making my way over to the groups of supporters who had given me such a great cheer as I ran past. We stayed around for another couple of hours, cheering the finishers through. 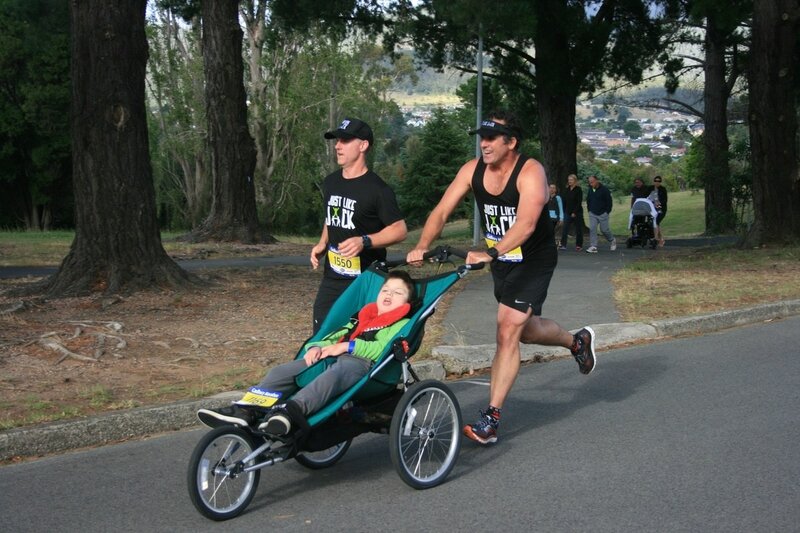 I was already on an emotional high, which amplified every positive experience, so I laughed and cheered as the little mini marathoners ran past, I enthused delightedly as practically each person I spoke to revealed they had also run a PB, and I even welled up a little when I watched our first time marathon finishers cross the line.